Responsibility, protection, stability, strength, order, focus, strategy, confidence, awareness, discipline. Cougar is in control of himself. The personification of masculine energy, he’s well respected and carries his position of power with reverence. Sensitive to his surroundings and with caring authority, he is confident and practical in his course of action. Draw upon the spirit of Cougar when you require extra energy and focus to get tasks done. When choices are to be made, it’s important to maintain concentration. Trust in your own judgment, and make wise changes in support of reaching your goals. 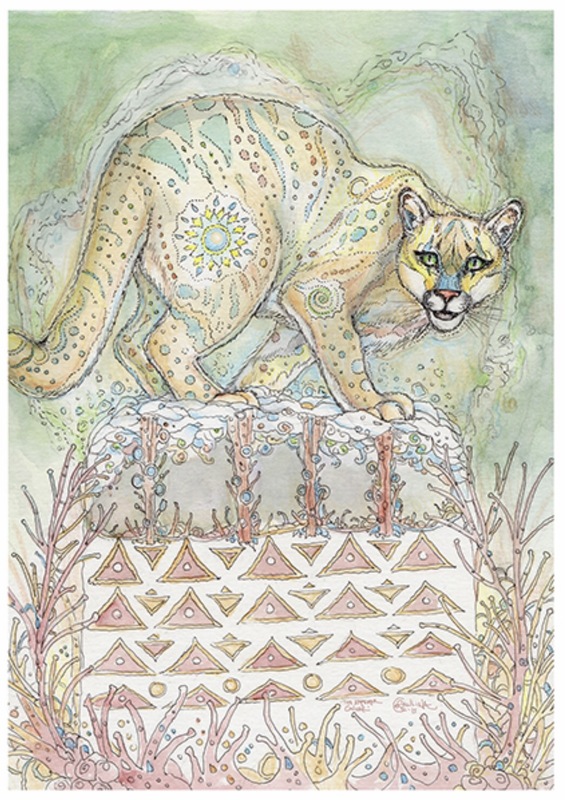 This entry was posted in Artist, Deck Review, Featured Card of the Day, General Tarot, Readings and tagged Cougar, Emperor, Paulina Cassidy, Spiritsong, Tarot.